Ready, steady…. – Forest & Bird Ready, steady…. Sarah Wilcox, Anton van Helden and Stefanie Rixecker have just set off on a trip with Heritage Expeditions to the Kermadecs. Tune in to our blog for daily updates from their trip! On board. Luggage stored. Lifeboat drill completed. Fuel pumped on. Now we’re waiting for a harbour pilot so we can leave the Port of Tauranga. 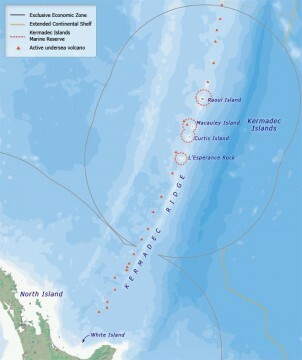 At 7.45 pm we will depart for the Kermadec Islands, the very most northerly specks of land that belong to New Zealand. I’m on board the Spirit of Enderby, a Heritage Expeditions vessel, with Anton van Helden and Stefanie Rixecker (and 48 others) and in a combo we will be bringing you highlights of the trip in a daily blog. I’ve already met people from all over New Zealand, Australia, Norfolk Island (“I was born there”), Greece and Belgium, and remembered to say “spaceeba” to the Russian crew. We are birders, plant nerds, divers, whale spotters and tourists who are travelling to literally the end of the Earth to see what’s there. I’ve come along because I want to see what these remote islands are like. 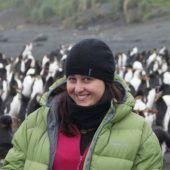 They represent one extreme of New Zealand’s hugely varied environments that range from cold, windswept, subantarctic islands on the way to Antarctica to these tiny subtropical offshore islands half way to Tonga. I want to see for myself how the Kermadec pohutukawa tree, tui, cicada, and many other species are different to the ones I know on mainland New Zealand, and take a peek underwater too. The Kermadec Islands are the visible tips of a chain of volcanoes that continue a line from Ngauruhoe and Ruapehu through White Island northwards. More than 30 more don’t make it to the surface. The Kermadec Trench is to our east and reaches depths of around 10,000 m – one of the deepest parts of the ocean. The organisms that live here, enduring total darkness and intense pressure, are incredibly unusual. We’re only just beginning to understand what they are and mechanisms they use to survive. So where to from here? We head north for 1000 km and by Tuesday afternoon will spot the first island, L’Esperance Rock. It was the hub of early sperm whaling in the Pacific. Then it’s on to Cheeseman, Curtis, Macauley and finally Raoul, the only island where we can land. Can’t wait! What a lot of skills you have among you. We will be waiting for your reports and discoveries and looking forward to Learning more about these fascinating islands. Will be very interested to hear of your experiences, especially the bird life. To go out and see for myself be a great experience.